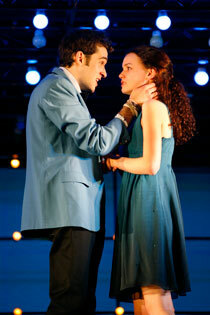 next to normal represents a new modern style of Broadway musical. If you thought Mr. Sondheim wrote serious musical theatre, meet Tom Kitt and Brian Yorkey the composer and lyricist respectively of this thrilling new musical. I'm not going to try and explain the plot except to say that this is the story of a family tormented by mental illness. next to normal finds its brilliance in the sum of its parts. To try and describe them individually would make the piece sound trite. This material is so accessible by anyone who has dealt with any kind of family trauma. The entire story is told using more than 30 songs that have a broad range of styles. You won't necessarily be humming them as you leave the theatre, but they do work to further the plot and they drive the show along nicely. Many of them are short and serve almost as a recitative in furtherance of the plot. Alice Ripley gives a raw and gut wrenching performance as Diana, a wife and mother who isn't fully in control of her own mind. In the show her diagnosis is given m many technical descriptions with bipolar seeming to be the most oft used. At the beginning of the show we meet the adoring husband, well played by J. Robert Spencer (Jersey Boys), Natalie, the child conceived under misguided intentions and Gabe, the perfect son. Or is he? Does he even exist? The answer is no. Gabe is dead and lives only in Diana's head. It is this ghost that haunts and torments Diana. Jennifer Damiano as the tormented daughter Natalie is sarcastic and caustic as she deals with growing up, a first love and a mother she is worried she might become. Her boyfriend is Henry the pothead played to lovable perfection by Adam Chanler-Berat. His attention to Natalie and her mother is gallant. While J. Robert Spencer did a terrific job in the role of Dan, his tenor voice didn't fit the role. It didn't have the years of torment in it; it was too pretty or even too young. If you saw him in Jersey Boys you will know that he is a talented man. As Gabe, Aaron Tveit is a loving son but also a torment to his mother. Mr. Tveit handles the wild swings of both the character mood and the vocals brilliantly. Louis Hobson as Drs. Madden and Fine makes the most out of his time to shine as a Dr. Jekyll and Mr. Hyde figment of Diana's mind. Director Michael Greif certainly knows his milieu. He has taken a dark subject and a talented cast and assembled them into a finely honed unit. Much as he did in his direction of Rent and Grey Gardens. Mark Wendland's set is brilliant and serves the production well, particularly when used to effect as Gabe watches down on his family. I do have one complaint. Frequently during the performance I was noticing that several of the actors had pitch problems. The orchestra was stacked on a second and third tier on opposite sides of the stage from each other. I found myself wondering if they couldn't hear the band. If I had a dollar for every time an actor ever said to me as a stage manager "can I get more monitor" (you know who you are) I would be rich. Something for the show to think about moving forward. Because I'm guessing this show is going to be here a while. Side note: This is the perfect musical to bring someone to if that someone ordinarily doesn't like musicals.